Google Webmaster Tools has an awesome feature called top pages. Why is this such an awesome tool you ask? Let’s take a tour down this rabbit hole together to see why! This is what the dashboard looks like. I have set this to show the change that my top pages have experienced over the last 30 days. Watch what happens when I click on one of black arrows for one of the top pages. 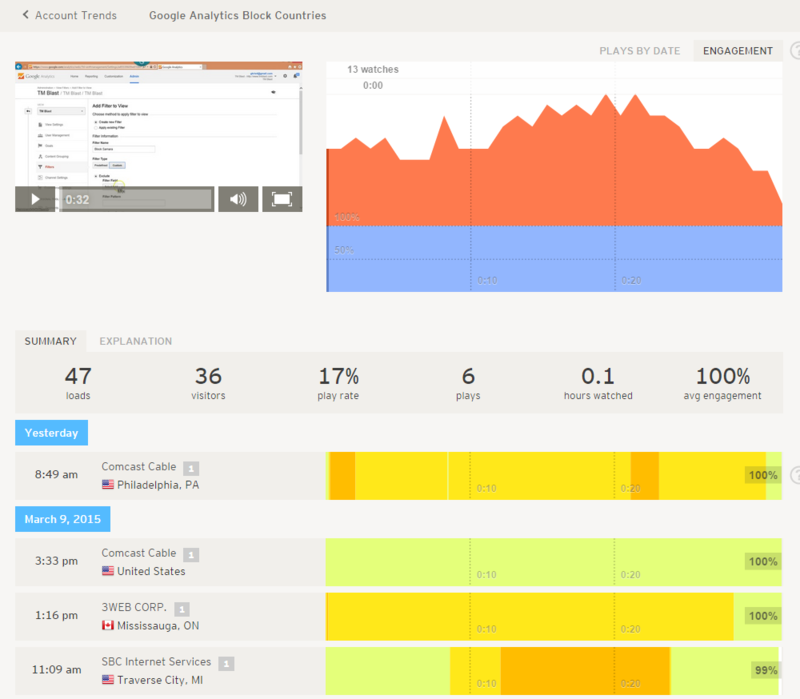 Now, I am given a lot of amazing data about what is creating impressions and clicks to that page from Google searches. Google will need to see a lot of data about a particular page to provide this data. For me, I start to learn a lot about some keywords. As a note, this is not 100% accurate, but it is a good start. I clicked on the very first blue keyword at the top to see some more data about it. Google shows me the page that this term is ranks for, the impressions, and the clicks from that term. The blue line represents impressions and the red line represents the clicks. If we look further down the chart, I can see the average positions in search results. I noticed something really interesting that I would like to go over. It is not shocking, but it shows how important it is to rank 1st for a term. This is a collective snapshot of where this term has ranked. When the term was on page one and between positions six and ten, I got twelve impressions and two clicks. This brought the CTR (click through rate) to 17%. That is actually really good in my opinion. I can get into ways to improve your CTR later, but for now, I just want to go over the next fact. I see that when that term was position one, I had eleven impressions, but managed to score eight clicks. That brought the CTR to a staggering 73%. There are many reasons why this term will not exactly rank first if you did that search in Google. Google is showing me the average position for this term. I did this search in incognito to give the most unbiased search. You will see my term is found at the top of Google which is awesome. So now, I am curious as to why this has such a high CTR. There are many reasons why this could be. I would like to go over a few things that I am predicting might cause this. Title Tag: I think a “how to” title tag stands out when I am looking to block these visits. I do like the second title tag, but I think the how to just performs better. URL: I have a pretty short URL for this page. I think a cleaner URL makes it easier for users to believe that this is a good search results. Meta Name Description: While the meta name description is a bit long on this, I think asking a question after having a “how to” in the title tag basically addresses both questions the user is asking themselves. They are asking how to fix this and they can relate with the message in the description. 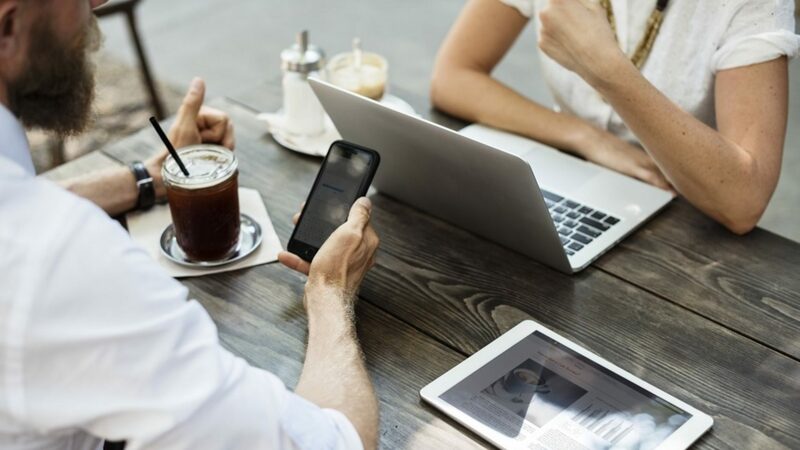 What about the data in Google Analytics? Great question! 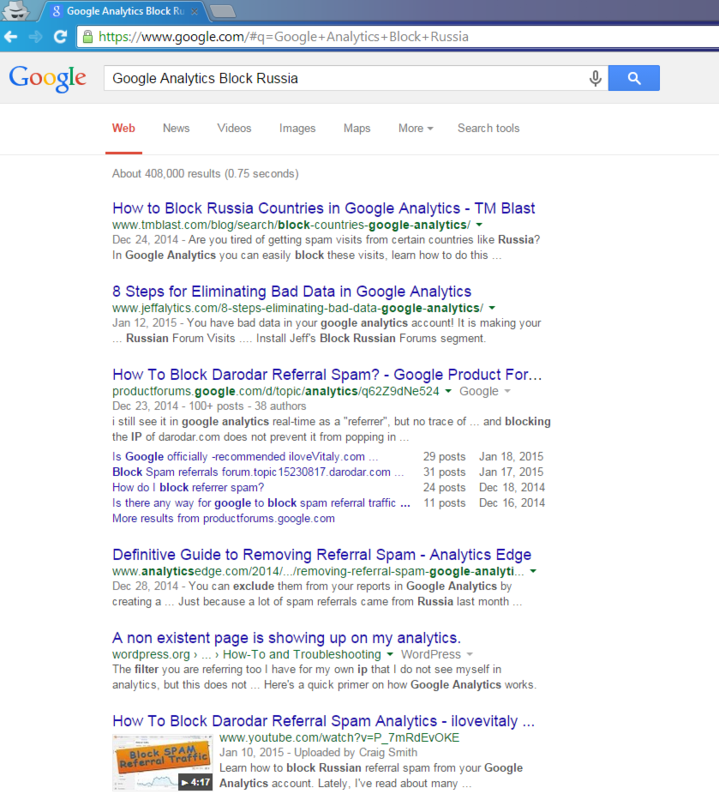 Let us take a look to see some of the data just from organic search to this page. Perhaps we can take away something from the data. So on the whole, I immediately cringed at the bounce rate. I see a 90% bounce for organic visits that scares me. I also see an average time of less than 45 seconds on this page. However, I am still ranking high. So what gives? I believe Google looks at something called the “pogo stick” effect. That term represents users who click on the page, but then immediately bounce off to go back to Google to click somewhere else since that result did not answer their question. On the whole, I see a high bounce and low time spent on page. However, I know that if a user stays on one page, but then leaves, Google Analytics will count it as 100% bounce and 0 seconds spent on the page. So, I see that the data looks bad, but maybe users are actually getting the answer to their question and not returning to Google. After all, they did their search and I hope they got their answer. Why would they need to go back to the search results to find something better? So, I hope that users are in fact staying engaged on this page. I decided to do two things. 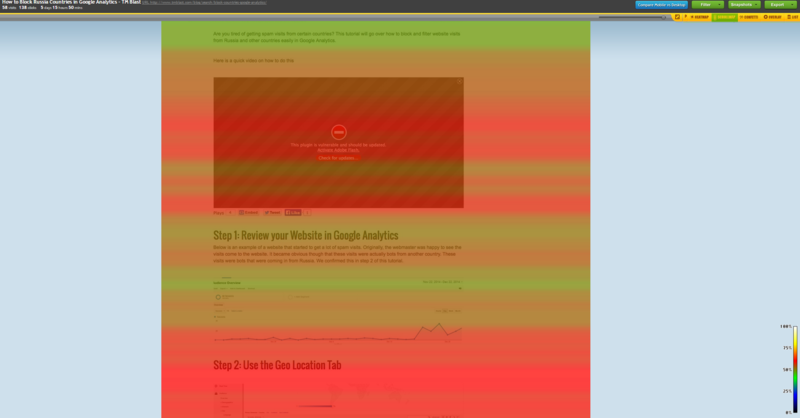 First, I created a heat map for this page. 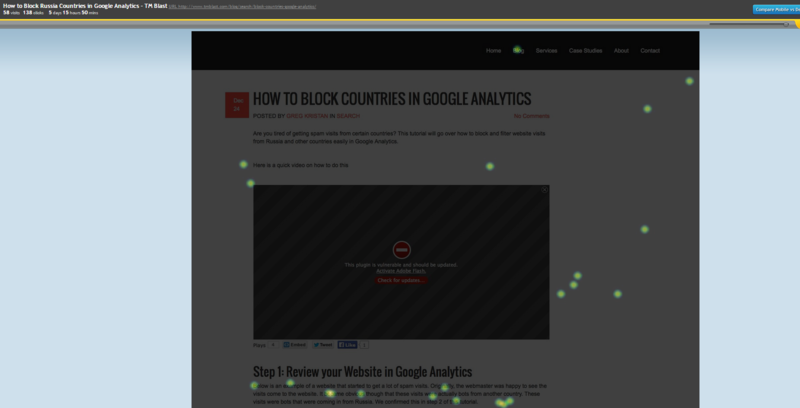 With the heat map, I wanted to see clicks and also scroll rate on the page. Here is a snapshot so far with the tracking. The results are not done, but I think it is cool to show what the data looks like. This is just a standard click heat map. I don’t find this to tell me much about what I am looking at. The scroll map from Crazy Egg is something that I love to look at. The colors represent how much scrolling activity happens on this page. Red and Yellow mean high scroll activity. Blue and black means low scroll activity. So the end of this post is in blue, but the top and middle has some great engagement in my opinion. So I already did this, but I added a video to this page last week. I did this for a few reasons. The first reason was because I think it can help the SEO on this page. I think having a video adds value to the user. Also, I have the video as self hosted, so I am getting all the SEO value. The second reason is that I can see who watches the video and how engaged they are with it. Here is a really small sample size of the views on this video. This data is so small, I thought about not even showing it. However, I think it is cool, so why not! The next thing I can do is look into some of the ranking terms and figure out a new strategy to start to rank for them. I could add more content to the existing page, add a few more of the terms, and add more semantic phrases all throughout the content. I could even add new sections addressing some search terms that I did not cover. I could even create a spin off blog post on my site to address a new set of terms if I think it would make sense for it’s own blog post.